Research, development and innovation (RD&I) has witnessed substantial development over the past decade in Ireland, thanks in large part to major public expenditure initiatives like the Programme for Research in Third Level Institutions (PRTLI) and Science Foundation Ireland (SFI). 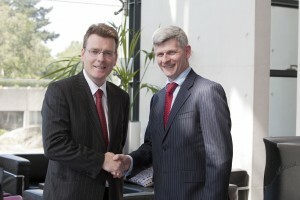 Pictured at a recent conference on research and innovation hosted by Leyton at the Irish Management Institute are: Dr. Pat McCloughan, Managing Director of PMCA Economic Consulting, and Mr. Martin Shanagher, Assistant Secretary General (Innovation and Investment) of the Department of Enterprise, Jobs and Innovation. The success of SFI and PRTLI reflects their design, as well as their scale, with the latter focusing on building the research and innovation infrastructure at third-level institutions and the former concentrating on attracting and growing the human capital needed to sustain world class scientific research in targeted areas, which are broadly biotechnology, information and communications technology (ICT) and renewable technologies. The growth in research and innovation achieved by PRTLI and SFI is being harnessed to boost Ireland’s attractiveness as a host location for inward foreign direct investment (FDI) and to enhance export performance by Irish-owned as well as foreign-owned enterprises. ‘Research’ can be thought of as the process of turning money into ideas, whereas ‘innovation’ is the process of turning ideas into money. The virtuous circle linking research, innovation, inward investment and exports is an important good news story amidst these straightened economic times. The potential employment impact of exports growth should not be discounted lightly. According to a previous PMCA Economic Commentary (Nov 2010), a 10% increase in the value of exports of goods and services from Ireland is associated with a 4% increase in employment, representing a quantitatively stronger relationship than what many economists would tend to expect on a priori grounds. Up to the beginning of the twenty-first century, there was very little public funding for RD&I (as it is now known) in Ireland and it is fair to say that the country was without any noteworthy international reputation in scientific research on an appreciable scale. Today, thanks largely to the investments facilitated under SFI and PRTLI, in terms of international scientific publications, Ireland is ranked in the top tier globally in molecular genetics and genomics, immunology and materials science and has attained a position in the upper echelons of computer science. However, some have questioned whether these major public investments represent value for money, in terms of commercial spin-offs and jobs. What needs to be remembered in any evaluation of public funding of RD&I is that the fruits from research, development and innovation take time to emerge, especially in countries like Ireland that have started from a low base. Dr. Pat McCloughan was part of the independent consultancy team that carried out the value for money review of SFI for the Department of Enterprise, Jobs and Innovation in 2007/08. The external review, carried out in 2007, when Dr. McCloughan was a director at Indecon, found that SFI has facilitated considerable advancement in the quality of scientific research conducted in Ireland and contributed significantly to Ireland’s rapid moving-up the international research publications league table in molecular genetics, genomics, immunology, materials science and ICT (e.g. semantic web design). SFI continues to appropriately focus on sustaining the gains achieved in scientific research excellence, which provides an important signal about Ireland’s competitive position internationally. Alongside the important focus on research excellence is the challenge to develop the commercial aspects of the research outputs, leading to new enterprises being spun-out of the research centres, collaborations and high-value employment creation. Currently, SFI-funded researchers have collaborations with over 500 firms (most of which are indigenous firms) and one of the areas cited for further development is the concept of Ireland becoming an international ‘test-bed’ for new technologies. Central to ensuring the transition from establishing excellence in scientific research to success in commercial innovation is what has come to be known as the ‘innovation ecosystem’. This basically refers to the education system, infrastructure, people, skills, capacity to generate new knowledge and the scope to apply new knowledge. It recognises the multifaceted nature of RD&I, including the fact that an increasing proportion of innovation is ‘open’ or conducted through external relationships and strategic alliances. As well as converting the research excellence built up in recent years into commercial innovation and jobs, another challenge facing the innovation ecosystem in Ireland is to ensure that it can produce and maintain world-class researchers of its own and not just be dependent on attracting the best scientists from other parts of the world, which has been a necessary and important part of the growth in the innovation ecosystem to date: for example, 40% of the grant holders under SFI are non-Irish researchers working in Ireland. Fundamental to achieving this aim will be to give prominence at all levels of the education system in Ireland to STEM subjects (science, technology, engineering and mathematics). This should include imbuing in students the principles of STEM subjects as well as their applications. Longer-term, the aim should be to nurture talent who will be capable of developing the fundamentals of their scientific disciplines as well as exponents specialising in technological applications. To meet this, education policy should not lose sight of the ‘rigour’ that is part and parcel of the mathematical grammar needed for scientific advancement. Another challenge facing sustaining the innovation ecosystem in Ireland is to ensure the sourcing of private sector financing. The Department of Enterprise, Jobs and Innovation would like to see two-thirds of RD&I spending coming from the private sector. Fiscal incentives, such as the R&D Tax Credit, have been designed and fine-tuned in successive finance acts with this target partly in mind. In helping to achieve the vision of a research-active and innovative society, there is also an island of Ireland dimension to the innovation ecosystem. Here, the aim of enterprise policy should be to facilitate firms on either side of the border to connect to the innovation infrastructures available island-wide, thereby helping to achieve scale – a necessary ingredient in the RD&I process. In this regard, there may be roles for the North South Ministerial Council and bodies like InterTradeIreland and the Centre for Cross Border Studies.